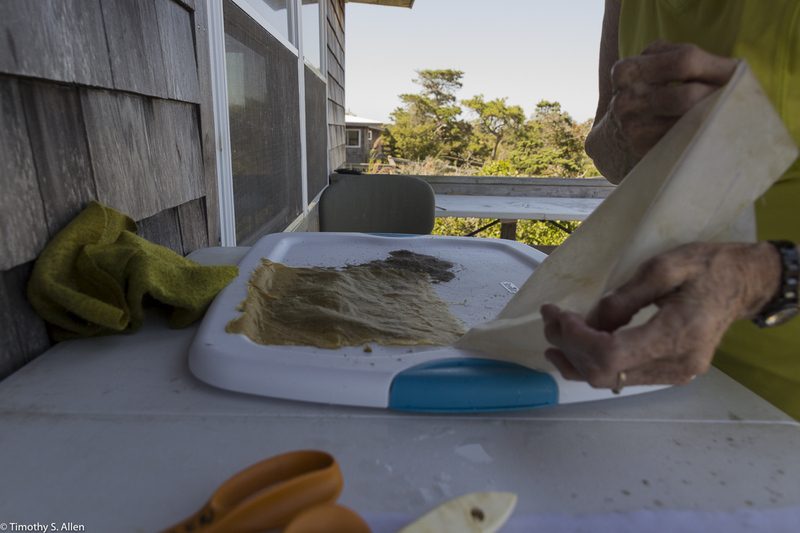 During my two-week artist in residency at Fire Island National Seashore from Sept. 5 to Sept. 19, 2015, I lived and worked at Watch Hill near the Watch Hill Ferry Station in Staff House #8. 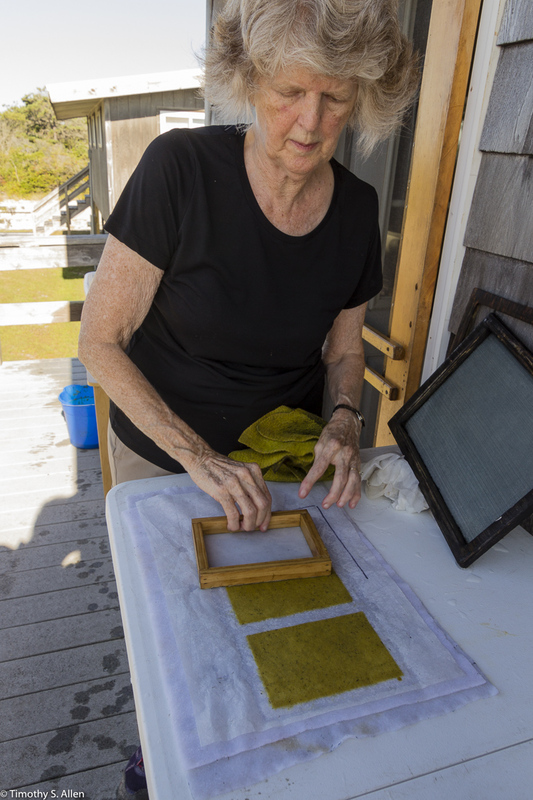 My husband Timothy S. Allen was able to join me for the residency, and Tim took many photographs of my process and the work I did at Fire Island. This was my first time to visit Fire Island, and I was inspired by the beauty of the place and its unique ecology. What impressed me most is that it is a natural area and a wilderness yet so close to New York City. This is one of most heavily populated regions in the world, yet Fire Island National Seashore offers a great nature experience with no cars, no restaurants, few stores and not so many people. It has an abundance of wildlife including many different plants…also many mosquitoes and deer ticks and lots of poison ivy that make gathering plant materials challenging! At Watch Hill there are usually only a few campers and boaters and day trippers who come over on the ferry from Patchogue during the weekends. My residency on Fire Island started on Saturday of Labor Day weekend, and it was very crowded and bustling with many boats, campers, and those who came for the holiday to enjoy the beautiful beach and the great sunny weather. After Labor Day things definitely were different and much quieter. There is ferry service to Fire Island Watch Hill Station on weekends until October, and the snack shop and store is open also on weekends. We brought all of our food and personal needs with us on the ferry when we came over from Patchogue, Long Island. I also had to bring everything I would need to do my artwork in the suitcase with me from California. 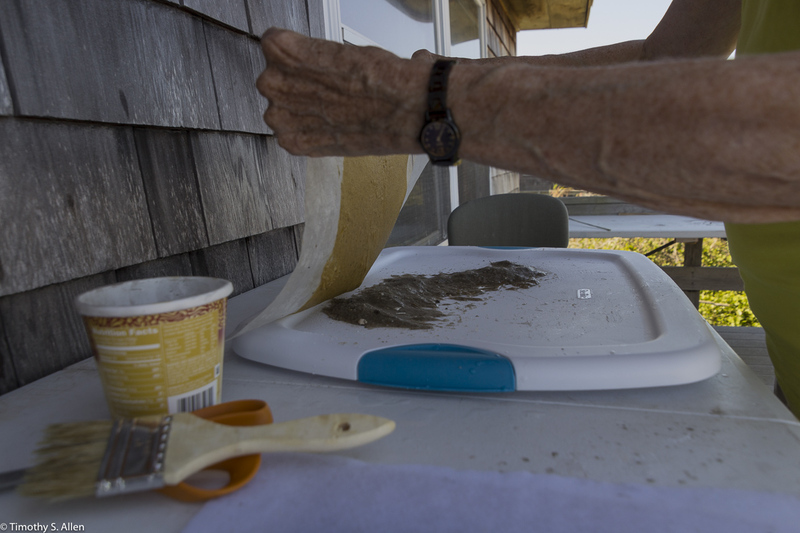 Fortunately I have an artist friend, Marcia Widenor, who lives in Sea Cliff on Long Island, and she helped me get together the things I would need for the residency. She let us borrow some sheets and towels and also buckets, plastic bins and stainless steel cooking pots. I brought all the other necessary items for hand papermaking in my suitcase. 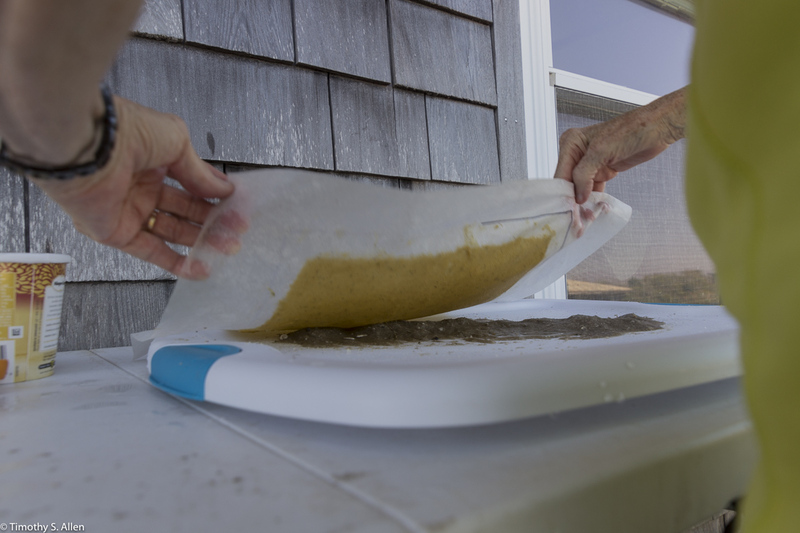 I am used to setting up a papermaking studio with minimal equipment and supplies and using what I find on site. I did bring in my suitcase a blender and a wooden hammer and some powdered formation aid, a few moulds and deckles, felts and non-woven interfacing as well as some miscellaneous art materials. 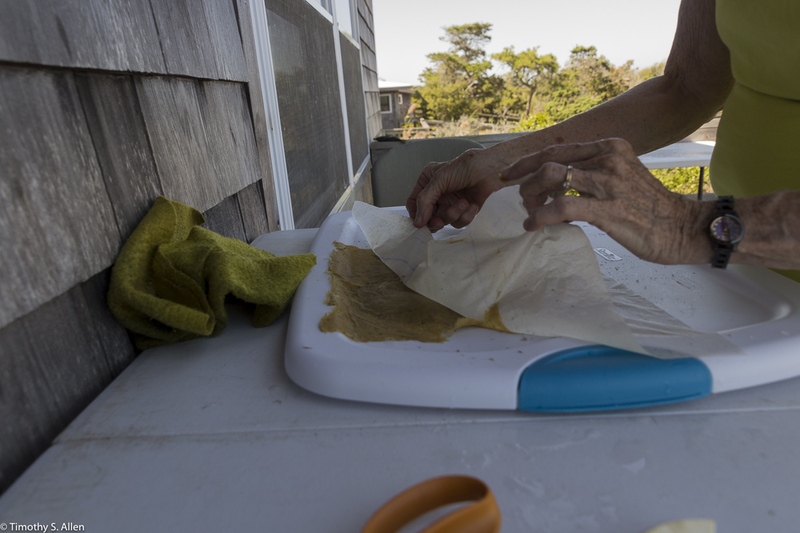 My plan for Fire Island was to make handmade paper for my artwork from the local plant waste materials, harvesting leaves and bark in a sustainable way so as not to harm any living plants. I used four plants that I collected and prepared on Fire Island. The vegetation for papermaking at Watch Hill is very limited, and I could find no trees that I could get the bark from to make paper. 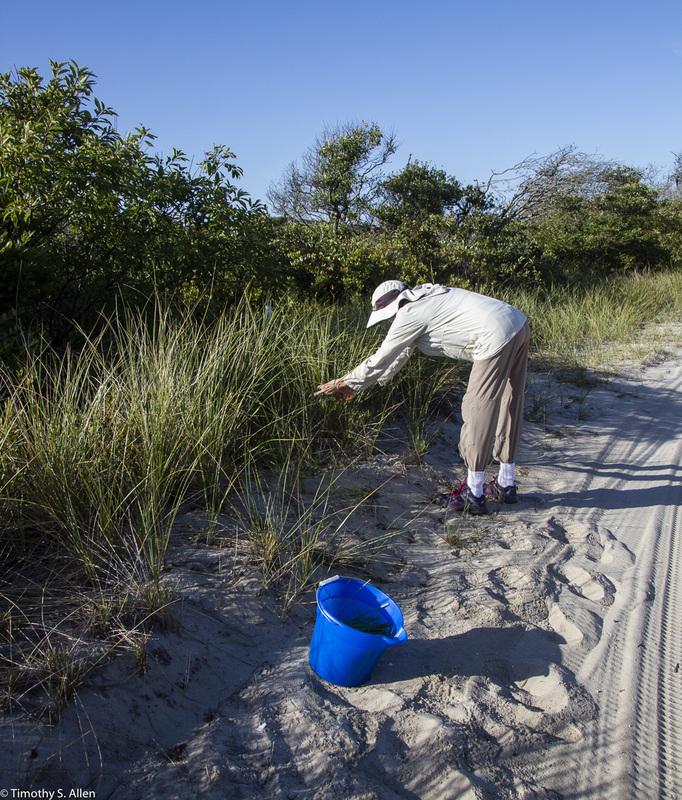 I did find many long leafed beach and marsh plants and was able to use the leaf plant fibers. The most abundant plant is Phragmites australis, or common reed, that is considered invasive. 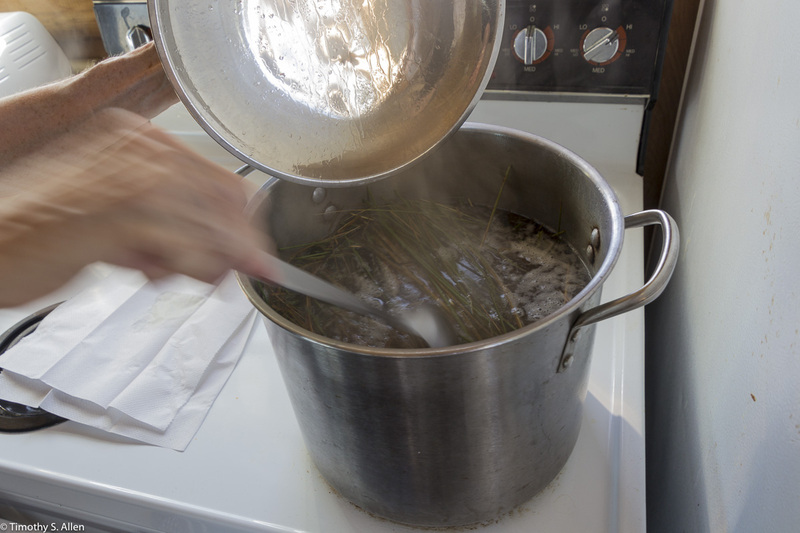 For my handmade paper, I used Phragmites, beach grass, Iris leaves and eel grass (seaweed). In this book I have outlined the recipes for making paper from each of these plants and included a sample of the handmade paper for that plant. 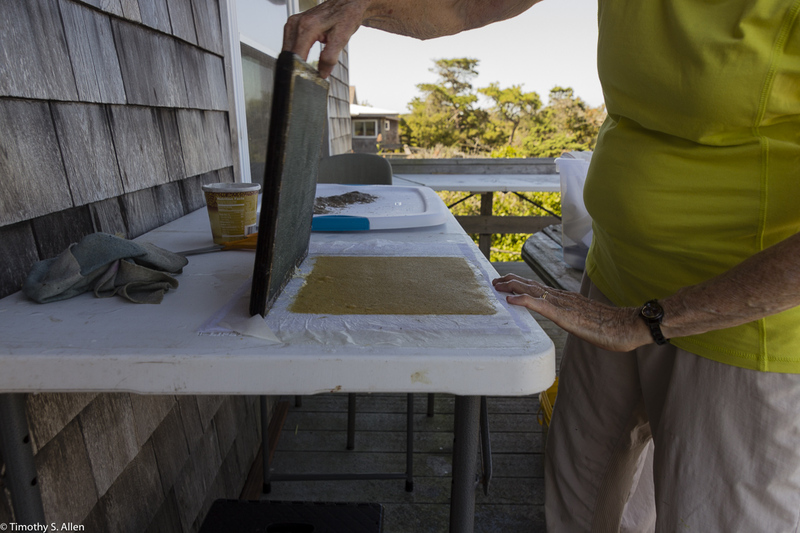 For one artwork I made on Fire Island I decided to try sand casting with handmade paper, placing sheets of the wet handmade paper created with local plants on the sand to dry. The beach at Fire Island National Seashore has beautiful almost white sand. I was also influenced by reading about the effects of Hurricane Sandy on Fire Island and how the shape of the island is constantly changing with shifting sands and changing ocean conditions. For the sand cast handmade paper, I made the sand wet and sculpted it to form dunes and added bits of the local plants in the sand. 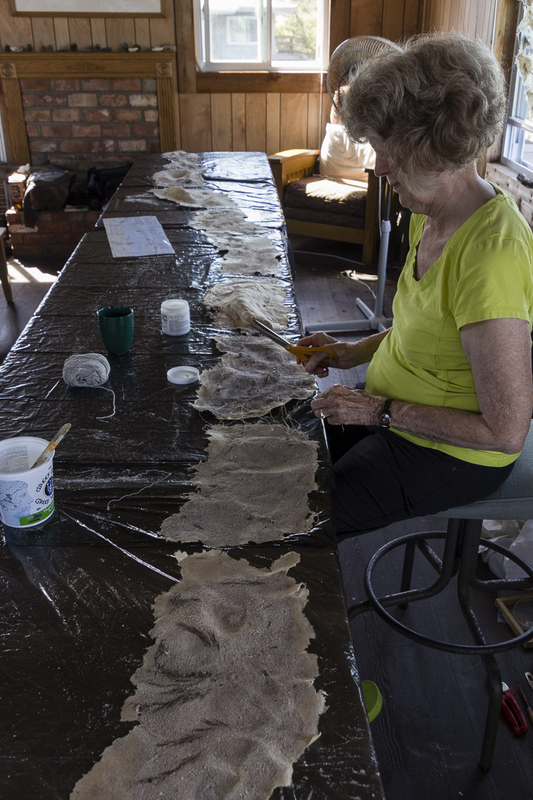 Then I placed my handmade paper on the shaped sand to dry. 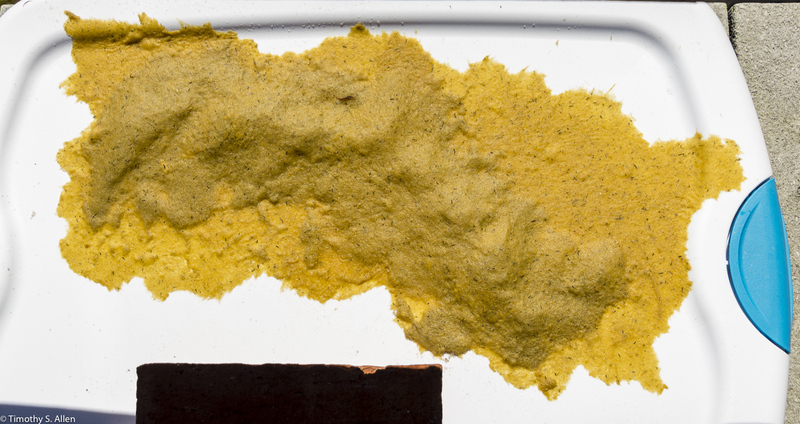 When the paper was dry I removed the handmade paper and dusted off the loose sand. Then I reshaped the sand for the next piece. Each sand casting was about 18 inches long and 12 inches high. For creating a Fire Island Site Map, I joined the pieces in a long curving shape with natural thread and used acrylic matte gel as glue. The total piece is about 18 feet long and 12 inches high and has a variable thickness from 1 inch to 4 inches. I plan to suspend this work from the ceiling near a long wall for an installation. It can also curve around a corner or hang out in space. It folds up at the thread for easy transport and storage, so I am able to bring it with me for later exhibitions. The many birds I encountered on the beach at Fire Island National Seashore inspired another artwork I created during the residency. I learned that the piping plover, an endangered species, nests near Watch Hill. I made a stencil in the shape of the piping plover with buttercut material on one of the small moulds I brought. I saw many plovers on the beach at Watch Hill, and one day a small flock of piping plovers came swooping in to feed near the water line as I was walking along the beach. These small birds really do make “piping” noises. 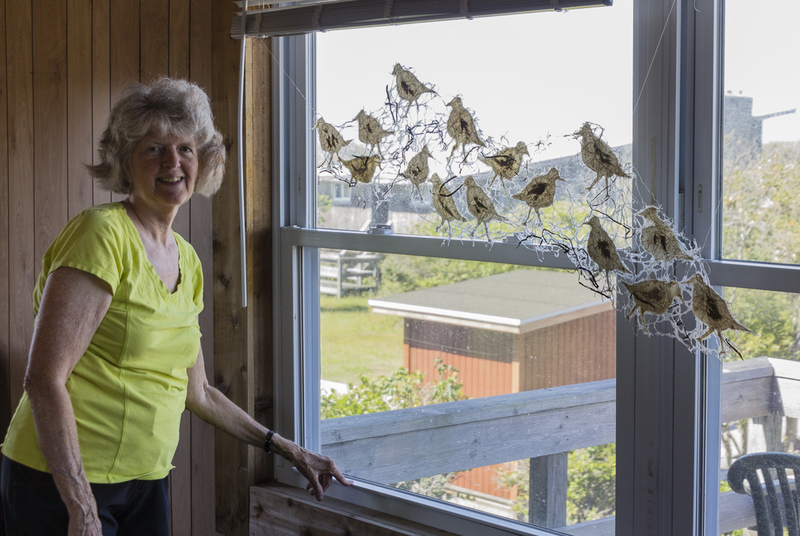 I created two suspended “piping plover” artworks (one piece has 15 plovers in the flock and the other has 9 plovers). 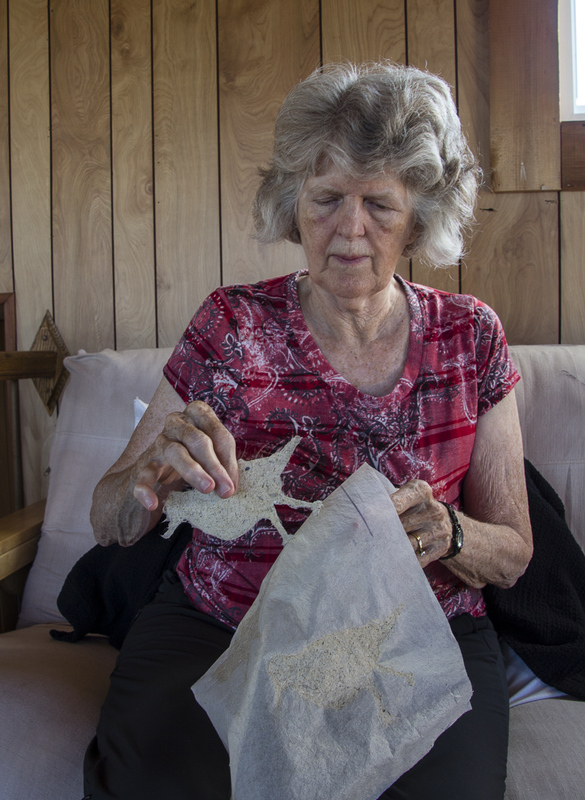 The handmade paper plover shapes are joined together with natural threads and I used Phragmites plumes, feathers collected on the beach and some seaweed (eel grass) to add details in the handmade paper birds. 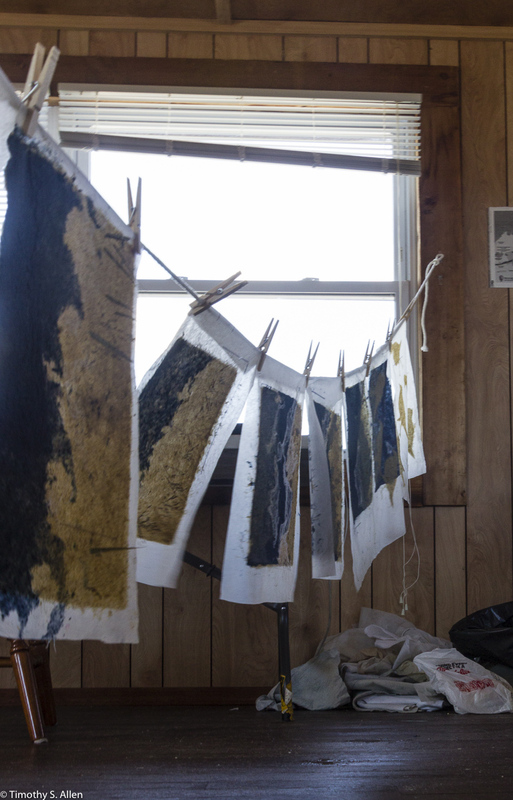 These artworks will hang in front of windows or from the ceiling with light coming through the thin Asian-style handmade paper. 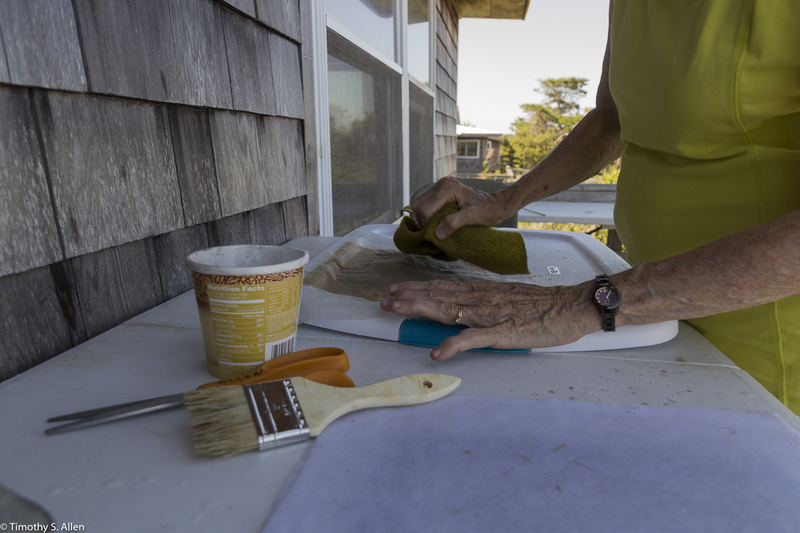 I also created other pieces of handmade paper from local plants during the time at Fire Island, and I plan to continue working with them when I am back at my home in Santa Rosa, California. This residency was a great experience for me, and I enjoyed very much the time to experiment and work with new and different plant fibers. It was also a great chance to be inspired by a beautiful national park area and a wilderness so close to New York City. I would like to thank the Fire Island National Seashore staff for all of their help, especially Interpretive Specialist/Park Ranger Kristin Santos and coordinator of the Fire Island National Seashore Artist-in-Residency program, Dawn Lee. Tim’s photo blog at http://allentimphotos2.wordpress.com also has other photos from our time at Fire Island National Seashore. What a great project Jane! Thanks for sharing! Best, e.
Sorry I missed this opportunity to see you. Glad you got had Marcia’s help. I love your birds!